With the last four posts as prelude, let’s consider finding the inverse of the function defined by . Notice that the function looks an awful lot like , except that the domain has been restricted. In this way, the left half of the graph of is essentially erased to produce the graph of . 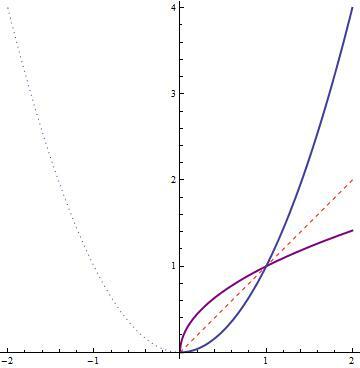 Also, the graph of can be produced by reflecting through the line , producing the purple graph below. Of course, the function is more customarily written as . Stated another way using the restricted domain of . Pedagogically, when teaching Precalculus, I’ve found that this way of writing the definition of is a useful prelude to the definition of the inverse trigonometric functions. 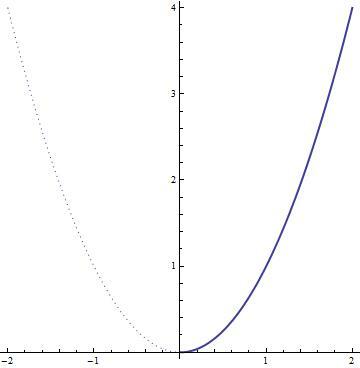 Notice that, if the purple parabola was completed, the full parabola would violate the vertical line test and thus fail to be a function. Thinking back to the original function, that’s another way of saying that the original full parabola violates the horizontal line test. Since and are inverse functions, it’s always true that and . However, and are not inverse functions, and so it’s possible for to be something other than . This subtle distinction will be discussed more in tomorrow’s post. Restricting the domain to was a perfectly arbitrary decision. 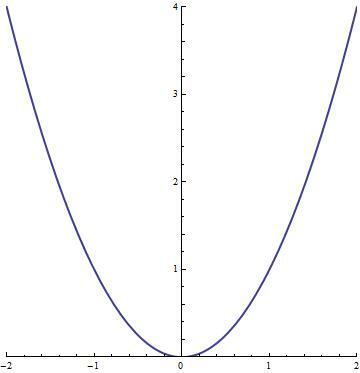 It would have been perfectly OK if we have chosen the left half of the original parabola instead of the right half, as either half of the parabola satisfies the horizontal line test. So why did we choose the right half (with the nonnegative domain) instead of the left half (with the nonpositive domain)? That I can answer with one word: tradition. (By the way, finding an expression for the restriction of to is a standard problem in a first course in real analysis.